I like trees...lots of trees. And after checking out the prices for ready made, I knew I would be learning how to 'create' my own. 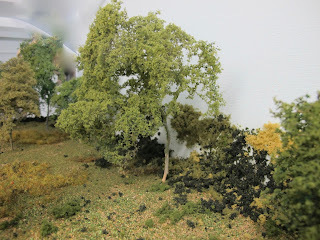 You tube is chock full of how to's on making trees. I watched a few and tried to pick out the best bits from each of them and try to employ them in my own tree making handiwork. For my first batch of trees I choose Scenic Express Super Trees in the super value pak. Apparently this 'tree' is harvested from the northland (Serbia) where it grows as some short type of scrub vegetation. 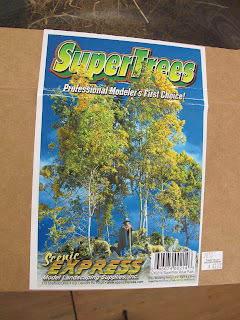 The trees are dried out and very brittle right out of the box. Some folks boil them to soften them up....an hour in super hot water does the same trick. Some will them hang them to dry and attach a small weight to the upside down tree to straighten it out. For most of mine I leave them be and just let them assume their natural shape. Next I mix a diluted batch of white glue and water....approximately 5 to 1 ratio. 5 parts water to 1 part white glue in a large pail or tub....big enough to submerge the twigs and trees. I do several at at time. Let them soak for a minute or so. Pull them out and shake off the excess medium and hang them to dry overnight. I've also had good success just laying them on a couple sheets of newspapers. Once dry you can start pruning and shaping. With these particular plants there is also a random leaf or two or dozen that need to be removed. A pair of long tweezers works good for this. Unless your modelling paper birch or a stand of poplars, most tree bark is not white, so some light painting of the trunk or main branch is necessary. I use various shades of flat grey, flat light green, and khaki colours. Cheap rattle can spray paint is what I use. Next up is the el cheapo unscented hair spray. Mist the branches and shake on some ground foam, or ground cover, pretty much anything that will hang onto the branches will work. Obviously you want to mix and match different shades and hues of greens, some light yellows for highlights. Then remist again with the hair spray and stand them in some extruded foam to dry overnight. Next day you can plant your forest and shrubs. I think overall my first batch of trees turned out not too bad. Lots of fine tuning to do as I go along for sure. Now I just have to ramp up and start reforesting the rest of the layout.